As part of the Health and Safety at Work Act, all car park owners and contractors operating car parks have a responsibility to ensure they are safe and suitable for the vehicles and pedestrians using them. There are various potential hazards to protect against in these environments, so it’s important to put traffic calming and protective measures in place. From ground floor level to multi-storey, here’s the essential safety equipment you’ll need to keep your car parks functioning safely and securely. A crucial aspect of traffic calming in car parks is restricting the speed of the vehicles. A speed limit should be set, ideally 15 mph or below, and clearly signposted. However, using signs alone is often not as effective as there will always be drivers who ignore the rules and go at their own speed. Therefore it’s best to include some speed bumps to encourage responsible driving, gain more control over the flow of traffic, and reduce the likelihood of a collision. Our speed bumps come in two heights; 50mm is recommended for when speed must be restricted to 15 mph and the 75mm height is recommended for speeds of 5-10 mph. These are clearly marked for enhanced visibility and are sold in bundles, complete with the caps and fixings needed for installation. In order to get the safest and most effective solution, positioning will need to be carefully considered. Vehicles should ideally drive over the speed bumps in a straight line, as turning on them may damage the speed bump and fixings, not to mention cause serious discomfort for the driver and their passengers. Bumps should also be set back from any junctions, to reduce the risk of vehicles stalling when pulling away. In order to control which vehicles have access to your car park, you may need a height restriction barrier. This is the best solution for preventing access to unauthorised areas such as staff car parks or in multi-storey or underground low-level car parks. It will deter larger HGVs or LGVs from entering and acts as a warning to these drivers that it is not safe to do so. Our height restriction barriers are quick and easy to install, and there is the option of adding a nudge bar so you can adjust the acceptable height according to your needs. 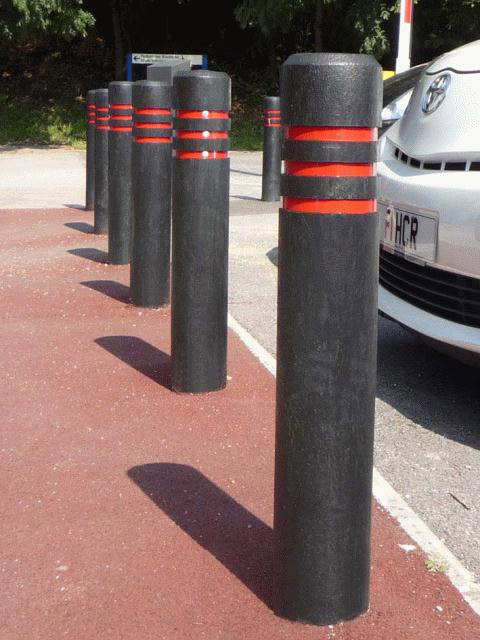 These come in 2000mm, 4000mm or 6000mm so you can choose the option that best suits your car park and the kind of vehicle you want to restrict access to. Another way to restrict unauthorised access and secure a large perimeter is to install permanent obstacles. Barrier hoops ensure that all vehicles attempt to enter at the dedicated entrance only and to indicate where the parking spaces end and where the safe pedestrian area begins. They can also be used to protect vulnerable entrances and exits to the building itself. For the safety of the drivers using your car park, it’s best to create an easy to follow one-way system. This will eliminate the need to reverse or do difficult manoeuvres that could result in a collision. The first way to control the direction of traffic is to include directional arrows on the road itself, but another is to incorporate flow plates. Flow plates only allow traffic to move in one direction and are most commonly used for entrances and exits on car parks, and are not suitable for HGVs. These offer a simple, unattended method of preventing vehicles from entering via a designated exit point. They should be accompanied by clear signage so that drivers have fair warning and should also be used in conjunction with speed bumps so that vehicles are slowed to the correct speed before driving over the plates. As with speed bumps, it’s important to select the right placement for your flow plates. They should always be installed on straight sections of road where vehicles are not turning, to avoid damage to the plates themselves and the vehicle travelling over them. The Ezi Klamp surface mounted flow plates are easy to fix or relocate should you feel the positioning needs to be adjusted, plus there’s no need to excavate the road surface! As well as ensuring that drivers are safe from potential car park hazards, you are also required to provide adequate protection for pedestrians. In addition to providing and maintaining slip resistant walkways, this requires you to put in place certain safety measures to ensure you are guiding them in a particular route and separating them from the flow of traffic. Pedestrian guardrails are a great option for where the visibility and safety of the users is of critical importance and can be used to clearly mark walkways that you want pedestrians to take. Another option is to incorporate bollards, which can warn drivers or pedestrians and bring their attention to areas or objects that may pose a hazard. If you ever need to carry out maintenance or construction work in your car park you will need to separate drivers and pedestrians from the area. Water filled barriers are perfect for creating a temporary barrier, and they can be easily stacked and transported so you can keep them on hand for whenever you need them. They are highly visible and provide a clear warning and barrier to car park users against the work that is being carried out. They are assembled with ease and can either be water filled or filled with sand for a more permanent solution. Once you have installed all of these car park products, you can monitor their usage and see how successful the measures you have put in place are. For example, this may highlight that you need to adjust the positioning of your speed bumps or flow plates. You may need to introduce more in the way of guidance for your pedestrians if you find they are still venturing into potentially dangerous areas of the car park or taking routes through traffic. The security of the fixings on these products should be checked regularly to ensure the car park remains safe and functional for all its users. All the products from our Car Park range are available in a variety of styles and finishes, from powder coated to galvanized, which suit any application and integrate into the surrounding environment. View the full range online today and get in touch with your car park requirements!